A live working example of ag-Grid with React and Redux can be found here. React is a great framework offering a powerful but simple way to write your applications. Redux offers a great way to decouple your Component state while making it easier to keep your data immutable. The completed code for this blog can be found here. In order to focus on the concepts being discussed our application is deliberately simple. We will have a simple Service that will simulate a backend service providing updates to the grid, and a simple Gridthat will display the resulting data. 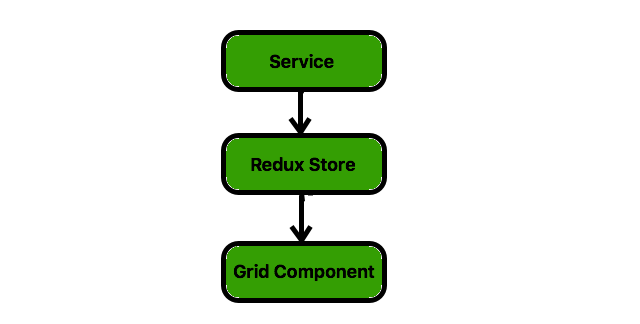 In between the two we'll have a Redux store to act as a bridge between Serviceand Grid. Our application is going to a simple Stock Ticker application — we’ll display 3 Stocks and their corresponding live price. The service manages the data — it has the current data and makes it available via Redux. In this example we have 3 rows of data (one each for Apple, Google and Microsoft) which the service periodically updates to simulate live price changes. The service is provided with the Redux stores dispatch (see later) which is uses to publish the data changes. With a fairly small number of changes to the seed project we now have a React application using both Redux and ag-Grid — fantastic! With this running you’ll see the prices updating — this looks great. There is one catch here though; the entire grid row data will be re-rendered if we leave the application like this, even though only a single row will be updated at a time. By making use of the new deltaRowDataMode in ag-Grid, we can ensure that we only re-render the data that has actually changed. Visually, the application appears no different with these changes, but performance has dramatically been improved. This would be evident in a larger application, especially one with a large amount of row data.